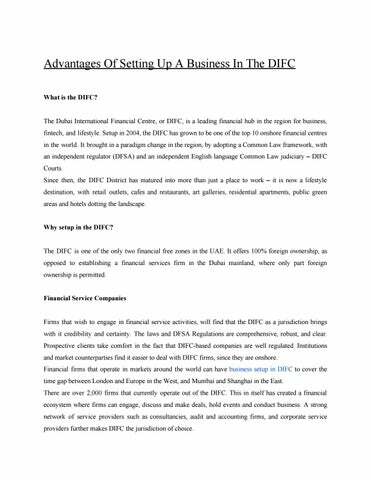 Advantages Of Setting Up A Business In The DIFC What is the DIFC? The Dubai International Financial Centre, or DIFC, is a leading financial hub in the region for business, fintech, and lifestyle. Setup in 2004, the DIFC has grown to be one of the top 10 onshore financial centres in the world. It brought in a paradigm change in the region, by adopting a Common Law framework, with an independent regulator (DFSA) and an independent English language Common Law judiciary – DIFC Courts. Since then, the DIFC District has matured into more than just a place to work – it is now a lifestyle destination, with retail outlets, cafes and restaurants, art galleries, residential apartments, public green areas and hotels dotting the landscape. Why setup in the DIFC? The DIFC is one of the only two financial free zones in the UAE. It offers 100% foreign ownership, as opposed to establishing a financial services firm in the Dubai mainland, where only part foreign ownership is permitted. Financial Service Companies Firms that wish to engage in financial service activities, will find that the DIFC as a jurisdiction brings with it credibility and certainty. The laws and DFSA Regulations are comprehensive, robust, and clear. Prospective clients take comfort in the fact that DIFC-based companies are well regulated. Institutions and market counterparties find it easier to deal with DIFC firms, since they are onshore. Financial firms that operate in markets around the world can have ​business setup in DIFC to cover the time gap between London and Europe in the West, and Mumbai and Shanghai in the East. There are over 2,000 firms that currently operate out of the DIFC. This in itself has created a financial ecosystem where firms can engage, discuss and make deals, hold events and conduct business. A strong network of service providers such as consultancies, audit and accounting firms, and corporate service providers further makes DIFC the jurisdiction of choice. Non-financial companies The world’s most successful financial centres create a broad base of economic activity. 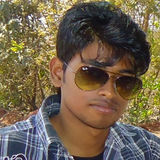 Non-financial firms provide the goods and services that core financial firms require in order to operate effectively. These include business consultancies, law firms, professional service providers and even businesses such as travel agencies and translation services. Not everything revolves around work however. Professionals look for a holistic lifestyle, and personal services such as tailoring, salons, gymnasiums, retail outlets such as restaurants and coffee bars, and even fine dining options to entertain their clients. The DIFC also offers a wide range of non-regulated activities, such as corporate offices, regional headquarters, family offices, holding companies and proprietary investment companies. Consultancies, service providers and product providers can also establish in the centre. These entities are not subject to regulation by the DFSA, and are authorised directly by the DIFC Registrar of Companies. Retail Outlets DIFC is situated in a prime location in Dubai, next to the iconic World Trade Centre and opposite Emirates Towers, parallel to the arterial road of Dubai - Sheikh Zayed road. Over 22,000 professionals live and work in the DIFC area. This presents a lot of opportunities for retail concepts, both high-end and bespoke. While there already exists a number of fine dining options, tailoring and shopping outlets and cafes, the upcoming Gate Avenue under the DIFC 2.0 master plan will provide a seamless, fully connected year-round walkable destination including an outdoor promenade. Conclusion The DIFC is a premier destination to live and work and brings with it several advantages and efficiencies. Setting up a company in the DIFC allows financial companies to have a base in Dubai and cater to the expanding MENASA market. It also helps service providers to have a presence in the heart of Dubai, and service multinational firms from the world over. And yes, retail concepts are able to get traction by attracting the attention of high-end clientele! The Article explains about the what are the advantages you will get if you setup business in difc or DIFC Company Formation.